Reminiscent of the late Rodney Dangerfield's lament, America's network of school buses get "no respect." The thousands "yellow buses" are buried without a mention in the most important tables of the US Department of Transportation's National Transportation Statistics. Neither the terms "school" nor "school bus" appear in tables summarizing the number of vehicles (Table 1-11), vehicle travel (Table 1-35), passenger travel (Table 1-40) and others. At the same time, there is far more complete information on virtually every other transportation mode. "School bus carriers operate the largest mass transportation fleet in the country. Each day, 480,000 yellow school buses travel the nation’s roads. Compare that to transit, with 140,000 total vehicles, 96,000 of which are buses; to the motor coach industry, with 35,000 buses; to commercial airlines, with 7,400 airplanes; and to rail, with 1,200 passenger cars. In fact, our school bus fleet is 2.5 times the size of all other forms of mass transportation combined." 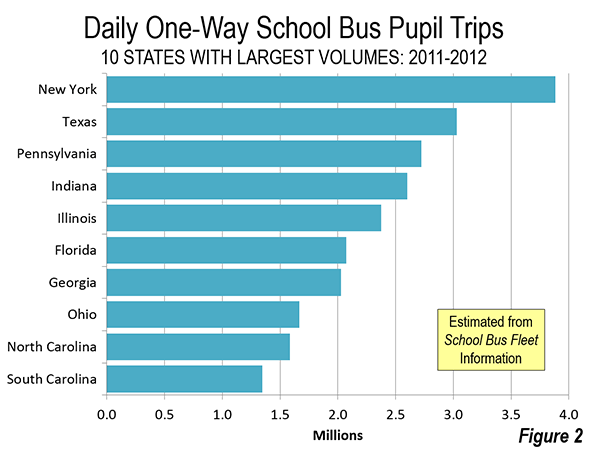 By at least that measure, the school bus system is the largest mass transportation system in the nation. The NAPT white paper (above) indicates that there are many more school buses than transit vehicles. School buses compare favorably to transit in other measures as well. According to the American School Bus Council (ASBC), school buses transported an average of 26 million elementary and secondary students daily in 2010 (see the ASBC summary of environmental benefits). This is 52 million one way trips. Approximately 55 percent of the nation's enrollment travels to and from school on school buses. By comparison, our analysis of Federal Transit Administration data for 2010 indicates that all transit services (subway, commuter rail, light rail, bus, paratransit, etc.) carried approximately 25 million one-way trips on the average weekday in 2010 (adjusted to eliminate transfers between vehicles on the same passenger trip, using an American Public Transportation Association estimate). On school days, it turns out that school buses carry more than twice as many passengers as transit passengers (Figure 1). 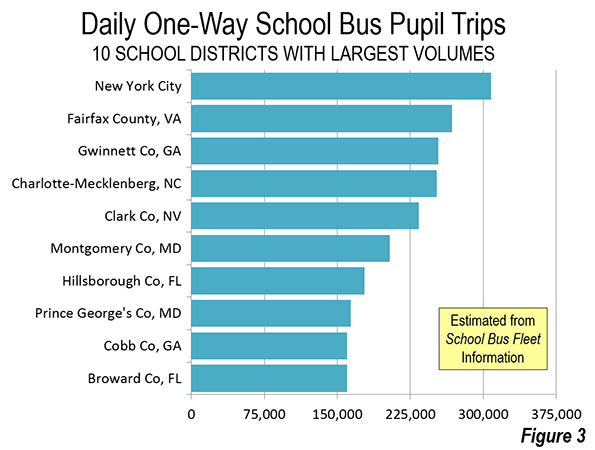 ASBC estimates the average one-way school bus trip at five miles. This means that every day, pupils travel approximately 260 million miles. The school bus advantage over transit is somewhat less in passenger miles than passengers, because transit trips are longer. School bus passengers travel approximately 50 percent more miles than transit weekday passengers travel (approximately 170 million miles). 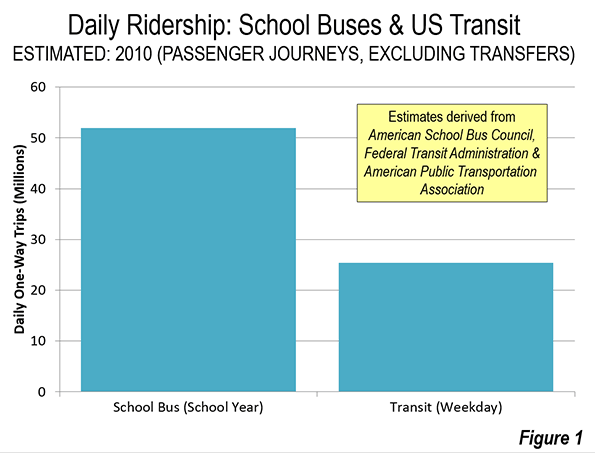 The annual differences in school bus and transit use are much less. This is because school bus service is provided only an average of 180 days annually, approximately one-half the 365 days that transit service operates. Based on the American School Bus Council estimate, the annual number of one-way school bus trips by students is estimated at 9.4 billion in 2010. By comparison, annual transit passenger journeys (excluding transfers) were an estimated at under eight billion in 2010. Transit, however, carries passengers farther than school buses each year. With its 365 day per year operation, transit carried 52 billion transit passenger miles in 2010, approximately 10 percent more than the 47 billion passenger miles traveled on school buses. Without a centralized digital data collection system, there is no readily available school bus data below the state level. Thus, unlike transit (with its National Transit Database), development of school bus information on a metropolitan area level would be time consuming and expensive and is not regularly done. Industry publications, such as School Bus Fleet and School Transportation Newsprovide detailed information but only at the state level. School bus services are provided nearly everywhere in the United States, in both urban and rural areas. 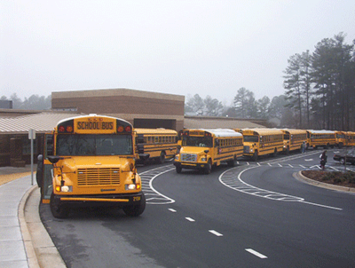 Most school bus service is provided by local school authorities (school districts). According to NAPT, about two-thirds of the service is provided directly by school transportation departments, while the other one-third is provided by private contractors ("outsourced"). Based on information in School Bus Fleet, all the top 10 states have school bus ridership of more than 1,000,000 one-way pupils every school day. New York has the highest ridership, at nearly 4,000,000. Texas has more than 3,000,000 daily riders, followed by Pennsylvania, Indiana, Illinois, Georgia and Florida, all with more than 2 million daily riders (Figure 2). The school districts with the highest pupil ridership are concentrated in the Northeast and South, which include nine of the 10 most patronized systems. The strong southern representation is largely due to the county level school districts, which are larger than the more local school districts typical in the rest of the nation. Based on School Bus Fleet data, the New York City school district carries more passengers than any other, with nearly 310,000 daily trips. Fairfax County (Virginia), Gwinnett County (Georgia), Charlotte Mecklenburg (North Carolina), Clark County (Nevada) and Montgomery County (Maryland) also carry more than 200,000 daily passengers (Figure 3). With the national school bus fleet nearing 500,000 vehicles, the state of New York has the largest number, at nearly 45,000, according to School Bus Fleet. Texas ranks second with 40,000 school buses, while Illinois, California and Pennsylvania have between 20,000 and 30,000 buses. The combination of just a few states can exceed the national total of transit buses (60,000). On any given school day, school buses are the largest transit system in the nation. Submitted by dankingbooks on Fri, 12/19/2014 - 09:06. Why is California left off most these lists? Why does NY have more buses than California? That makes no sense. I have always hated school buses. I hated riding in them. I felt sorry for my kids when they had to ride them. And now I resent them needlessly blocking traffic. When I was a kid I had to walk about half a mile to the school bus stop. But now the buses stop in front of every door. It's nutty. Submitted by S-M on Tue, 12/23/2014 - 17:03.